If the allure of onyx, ruby, emerald and other bold, saturated hues has caught your eye, this palette makes it easier to dive in. Explore the design impact–both big and small–darker shades can have on your home. This palette of 23 colors was hand-selected to interact seamlessly. Mix, match and put the power of the Benjamin Moore Color & Design team to work for you. Deep colors bring a sense of drama to any room. But what about the softer side? When it comes to darker colors, light is a powerful protagonist. Deeply-hued rooms with skylights, French doors, or any level of ambient light help to enhance deep colors, creating an intriguing interplay of light and dark. Take the gray undertones of Shadow 2117-30–our Color of the Year 2017–for example: The purple hue responds more like a neutral under the influence of natural light. As the day gets darker, Shadow deepens, adding more intensity to the room. Wet Concrete 2114-40 has a similar effect. 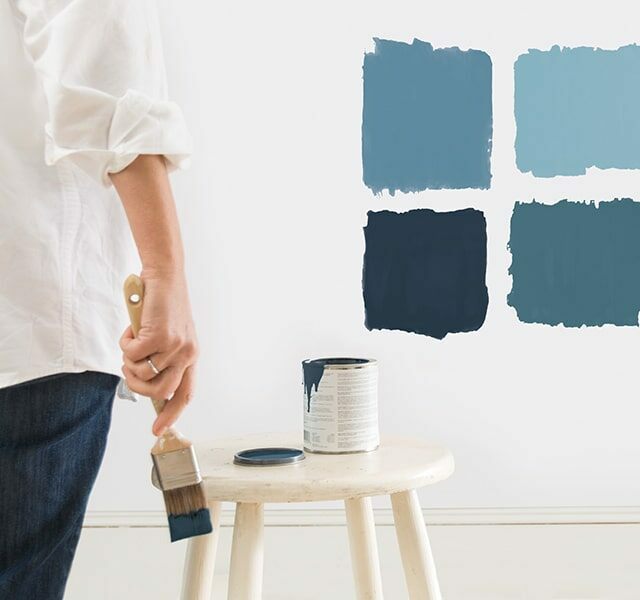 Embolden a project– Paint the inside of your book shelves or a small powder room with deep hues–they’re perfect projects for testing out stronger shades. Use a bold stroke– Add some punch to a flight of wooden stairs with a banister in Night Shade 2116-10 or risers in Salamander 2050-10. Or test the waters on a smaller-scale accent wall as seen here. Look inside– Are deep colors in your wardrobe? In your jewelry box? Pay attention to your personal color palette. "GOLD LEAF, SILVER THREADS, BULLION EMBELLISHMENTS…THESE ELEMENTS ARE MEANT TO BE SEEN IN A DARKER ROOM." If you choose deep colors on the majority of a room’s walls, fabrics like velvet or brocade provide both balance and dimension. Consider fabrics in lighter shades for an appealing contrast against more intense colors. Metallics also work wonders against deeps, bringing reflection and energy into a deeply-hued room. Bronze picture frames, sterling silver candlesticks or a polished chrome lamp add iridescence and reflection. Colors mentioned here are available for use in a range of Benjamin Moore paints. Explore the product that's right for you in The Right Paint or Stain for your Project section. Spark your creativity with a range of design and color ideas for your home.